During the Mexican-American and Civil Wars, Marines carried a flag similar to the national flag, comprised of red and white stripes and a union containing an eagle perched on a shield of the United States and a half-wreath beneath the shield, with 29 stars encircling the entire design. Beginning in 1876, the Corps carried the national flag with "U.S. Marine Corps" embroidered in yellow on the middle red stripe. When the Marines landed in Vera Cruz, Mexico, in 1914, they carried a flag consisting of a blue field with a laurel wreath encircling the Marine Corps emblem in the center. Above the emblem was a scarlet ribbon with the words "U.S. Marine Corps," while a second scarlet ribbon below the emblem bore the words "Semper Fidelis." On April 2, 1921, orders were issued directing all flags be manufactured without the yellow fringe and without the words "U.S. Marine Corps" embroidered on the red stripe. On March 14, 1922, an order was issued retiring the use of all national colors still in use with yellow fringe or wording on the flag. After World War I, the Marine Corps adopted the Army's practice of attaching silver bands carrying inscriptions enumerating specific decorations and battles. This practice continued until January 23, 1961. On April 18, 1925 Marine Corps Order No. 4 designated gold and scarlet as the official colors of the Corps. However, these colors were not reflected in the official Marine Corps flag until January 18, 1939, when a new design incorporating the colors was approved. The design was essentially the same as today's Marine Corps flag. For a short time after World War I, battle honors were inscribed directly on the flag of a unit was in practice, the potential of a multiplicity of honors and limited space on the colors made this practice impractical, and it was discontinued. On July 29, 1936, a Marine Corps Board recommended the adoption of the Army's practice of attaching streamers to the staff of the organizational colors. The system was authorized by Marine Corps Order No. 157, on November 3, 1939, and is the system currently in use. 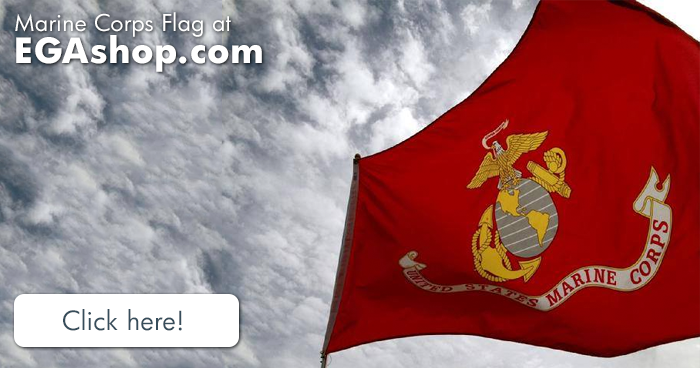 The EGA Shop has a beautiful nylon Marine Corps Flag available. EGAshop.com is MarineParents' online store, where 100% of the proceeds benefit the outreach programs of the organization. This flag is made of a durable, lightweight nylon and is 100% made in the USA to the highest standards. Each flag is finished with a strong canvas heading and two brass grommets. This flag is great for indoor or outdoor display, and is ideal for rainy areas, as it is quick-drying. The lightweight, close weave enables it to fly in the slightest breeze for full visual effect. This flag is a single reverse image. 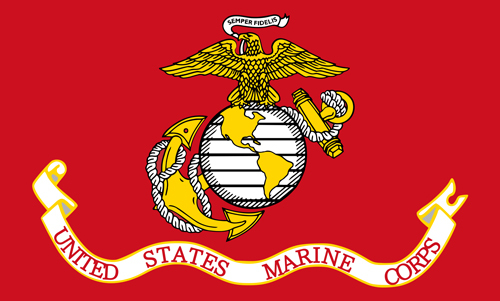 The Marine Corps flag is scarlet and shows the Marine Corps emblem, which contains a fouled anchor, a globe displaying the western hemisphere, and a spread American Bald Eagle atop the globe. A ribbon held in the eagle's beak carries the Marine motto, "Semper Fidelis," (Latin for "always faithful"). Below the emblem a larger ribbon holds the title, "United States Marine Corps."